I’m not sure whether I like to cook, or whether I just like interesting foods. Either way, I cook pretty much daily, even if it’s just for myself. And to liven things up, I enjoy exploring flavors and dishes from around the world. One of my favorite flavors is lemon. Lemon cake, lemon bars, lemony hummus, lemon in my soup, lemon on fish, lemon on vegetables, grated lemon rind on anything savory, and even, yes–lemonade. So when I ran across a new-to-me way to use lemon, I was on board: Preserved Lemons. Preserved lemons are whole lemons packed into salt. You shake the jar daily for about a week, then put them into the fridge. Soon the pith is pretty much gone and all that’s left is sour/salty rind. It goes great with all kinds of dishes, often replacing the salt in the recipe altogether. I try to keep some in my fridge now at all times. So why am I writing about food? 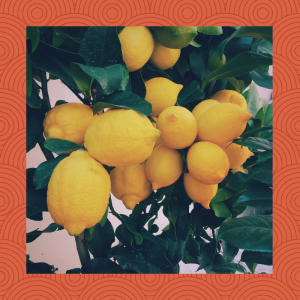 I recently wrote an article about my journey to publication, in which I used the cliche, “When life hands you lemons, make lemonade.” But my journey took so much longer than most that my “lemons” had to be used for something with a long shelf life. I turned the cliche into something personal, and compared my journey to publication with turning life’s lemons into preserved lemons, seasoned by the salt of my many writer friends who kept me going. If you’d like to try preserved lemons yourself, here’s the recipe I used, from food writer Tori Avey. And remember, when life hands you lemons, stick ’em into salt to preserve them!